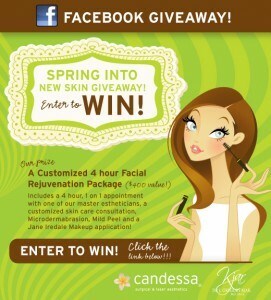 Home / Blog / Spring Into New Skin Facebook Giveaway! Spring Into New Skin Giveaway! Includes a 4 hour, 1 on 1 appointment with one of our master estheticians, a customized skin care consultation, microdermabrasion, mild peel and a Jane Iredale Mineral Makeup Application. Enter to win between May 2, 2011 and May 11, 2011. Get your friends to vote for you between May 11, 2011 and May 19, 2011. Winner announced Friday, May 20th!